LANDOVER, Md., May 31, 2016—Nearly 9,000 middle school students have learned lessons this year that will help them finance cars and balance their budgets later in life, thanks to an educational branch of PenFed Credit Union at Maryland’s first Junior Achievement Finance Park®. Left to right: Ed Grenier, president and CEO of JA of Greater Washington, Sarah Dohl, Vice President of Communications, JA of Greater Washington, Nora Wheeler, Director of Development, JA of Greater Washington, Rachael Doss, Vice President of Development, JA of Greater Washington, and James Schenck, president and CEO of PenFed Credit Union. As the students enter the doors of JA Finance Park, they leave behind their lives as middle school students and assume an adult financial identity: an avatar with a career, salary, credit score, debt, family, and financial obligations. On tablet computers, led by volunteer role models from the community, students make their way through various life stages, adjusting their budgets for unexpected events. The PenFed Credit Union educational branch empowers each student to decide how to finance a car within a budget. As in real life, each choice a student makes—the type of car, the options, and the terms of the loan—will have an impact on their bottom line. But instead of waiting until the end of the month to discover whether they can make ends meet, students at JA Finance Park figure it out by the end of the day. The 13,500-square-foot experiential financial literacy supercenter is located on the campus of G. James Gholson Middle School and Cora L. Rice Elementary School in Landover. PenFed Credit Union’s partners include Capital One Investing, Chick-fil-A of Capital Boulevard and Steeplechase, Community Foundation of the National Capital Area, Doctor’s Community Hospital, E*TRADE, Enterprise Rent-A-Car, Financial Assurance Corporation, Geico, Lerner, Maryland-National Capital Park and Planning Commission, Pepco Holdings, Inc., Prince George’s County Community College, United Healthcare, Walmart, Washington Gas, and the Washington Redskins Charitable Foundation. 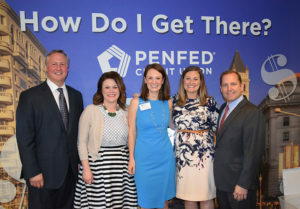 Established in 1935 as the War Department Credit Union, PenFed Credit Union is one of the largest credit unions in the country, serving 1.4 million members worldwide; with $20 billion in assets. Its long-standing mission has been to provide superior financial services in a cost effective manner, while being responsive to members’ needs. PenFed Credit Union offers market-leading mortgages, automobile loans, credit cards, checking, and a wide range of other financial services with its members’ interests always in mind. PenFed Credit Union serves a diverse population, and no military service is required to join. We offer many paths to membership, including numerous employee groups and association affiliations. It’s easy to apply. We invite you to come see why you belong at PenFed Credit Union. To learn more about PenFed Credit Union, visit PenFed.org, like us on Facebook and follow us @PenFed on Twitter. Interested in working for PenFed? Check us out on Linkedin.We are proud to be an Equal Opportunity Employer: M/F/V/D.